Police have named a 14-year-old girl who died when she was swept away in a swollen river while on a training expedition on Dartmoor. Charlotte Shaw, from the Torrington area in Devon, was in a party of 10 from Edgehill College who were training for the Ten Tors Challenge. The event sees thousands of youngsters walk on courses across the moor. 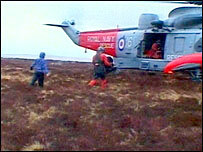 Twenty-six people from three schools, including Edgehill, were airlifted from the moor in atrocious weather. Devon and Cornwall Police are investigating the incident, which happened at about 1405 GMT on Sunday, and the coroner's office has been informed. Members of the dead girl's team will be interviewed as part of the police investigation. Det Ch Insp Steve Carey said: "There is absolutely no suggestion at all of wrongdoing. "The police are here to fully investigate the circumstances and report them to the coroner." An army spokesman said all groups had trained managers and it was the first time a fatality had occurred in either training or during the event itself. He said: "The student was part of a managed group from her college and all managers undergo mandatory training where they are instructed in training and preparing a team." The army, which has organised the trekking expedition since 1960, said it would go ahead as planned in May. The challenge involves youngsters walking on courses of up to 55 miles (86km) across the moor. A statement for Edgehill College described Charlotte as "a delightful member of our school community" who would be enormously missed. The college said she was involved in many activities and helped to coach younger pupils. The statement said: "We are all shocked by the tragedy and are working to support all the pupils and staff in coming to terms with what happened." A tribute was posted on the Ten Tors expedition website stating "everyone associated with Ten Tors, past and present, would like to express their sympathy and heartfelt condolences to the family and friends of the young girl who tragically died following an incident at Walla Brook this weekend." About 85 teams were training on the moor over the weekend. Two other teams, from Milton Abbey School in Dorset, and Lipson Community College in Plymouth, were also airlifted from the moor after calling the Dartmoor Rescue Service on Sunday.